The dragon fruit grows on the pitaya cactus plant. The cactus grows up to four feet tall, and is pruned to encourage sprawling branches like a tree. 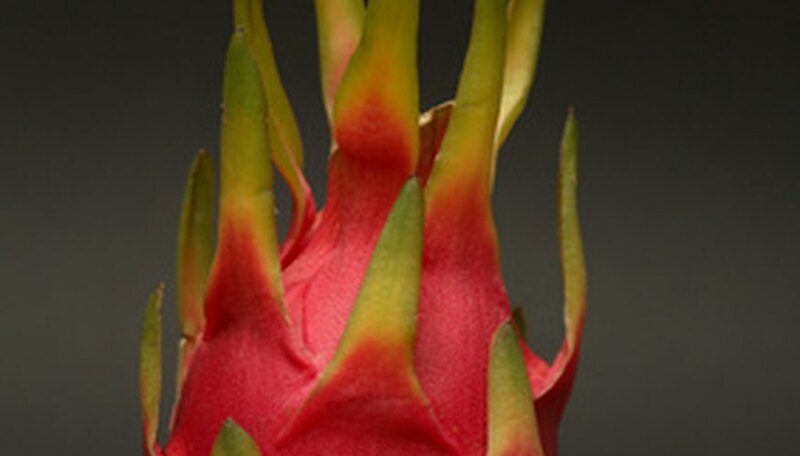 The dragon fruit plant can be grown from seed, but is most often grown from a stem cutting. Pieces of stem root so readily that it can become a problem if cut pieces are left in the landscape after mowing or other damage to the plant. Plant two or more dragon fruit trees, many varieties need another plant for pollination. The dragon fruit tree blooms several times a year and can produce up to 220 pounds of dragon fruit on a single plant, according to the University of Florida IFAS Extension. Plant dragon fruit in a well-drained location with light shade or full sun. Dig a large hole, three to four times as deep and wide as the root ball of the plant. Moisten the soil and add four to five pounds of organic compost to the native dirt. Plant the dragon fruit cactus at the same level it was originally growing. Firm the soil around the plant. Fertilize a month after planting, and every second month after, with a balanced fertilizer such as 13-13-13. Apply four to six nutritional sprays between March and September. Provide a strong support for the plant. The side branches and fruit can eventually weigh several hundred pounds. A strong T-shaped trellis or pile of rocks is best. Water the dragon fruit tree as needed during the fruiting months. Water deeply and allow the soil to dry out between waterings. The dragon fruit tree is a cactus, but needs moisture to produce fruit. Mulch the area around the dragon fruit tree with three to six inches of organic mulch. Keep the mulch away from the main stem to prevent rotting. Train the plant by pruning away side branches until the tree reaches the desired height, just above the top of the trellis. Use clean pruning shears to remove the branches at the trunk. Cut off the tip of the main trunk when the tree reaches the desired height, approximately three to four feet. Allow branches to form at this time. Tie the main trunk and the branches to the supporting trellis. Prune two to three times a year to remove dead and damaged branches, keep the plant up off the ground and maintain a good size. Remove all cuttings from the area. Protect plants from freezing temperatures by covering the plants with blankets or tarps when a freeze is expected. Plants are damaged below 31 degrees Fahrenheit, but may grow back from the root if the damage is not severe. Protect dragon fruit trees from sunburn in areas with low humidity or high altitude. Use a shade cloth during the first few months after planting. Harvest the fruit 30 to 50 days after it appears. The fruit are ready at 30 days, but will get larger and sweeter as they grow. Wear gloves and protective clothing when working with dragon fruit trees. The spines are sharp.